All of us want a relaxing bathroom because we are there not just to clean up but to relax too. When we are from a day’s work, we want to spend some time in a spa but we do not have enough time to do it. Merely the trip in going to one would take time already. 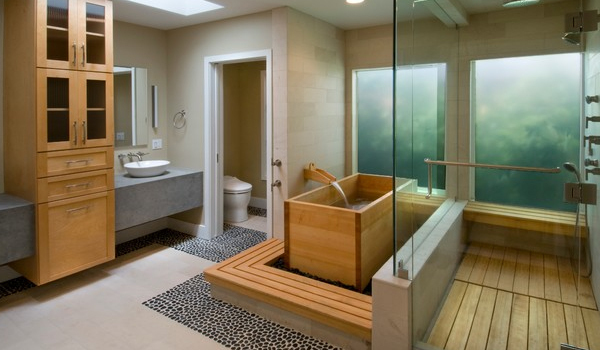 Would it be very convenient if you have a space in your house that reflects a spa feel? It would really be perfect! You can actually turn your bathroom into a space with a spa atmosphere. And if you think it is hard to do it, it really isn’t. You can just stick to the same bathroom you have and add some spa-like items. Or you can do a little interior improvement too if you have the budget. 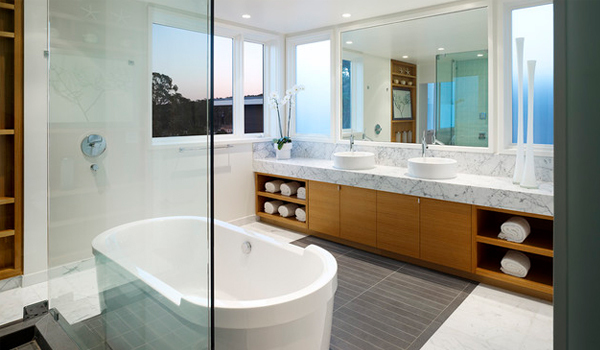 One major thing to do in order to give your bathroom a spa aura is to eliminate clutter. Now that isn’t so hard. 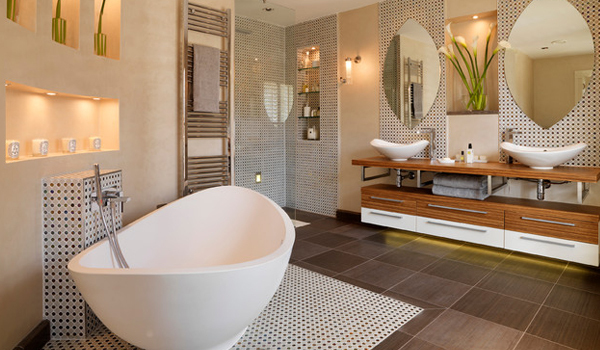 Below are easy tips to turn your bathroom into a spa retreat. After this, you can now de-stress in your own home! 1. Use earth tones or neutral colors. Using earth tones or even neutral colors will give your space a calming effect. You can stick with using white and then add some accent colors. The colors that you will choose should be light too like pale blue and beige to give the bathroom a relaxing feel. But most spa would use earth colors which can be a good choice too. 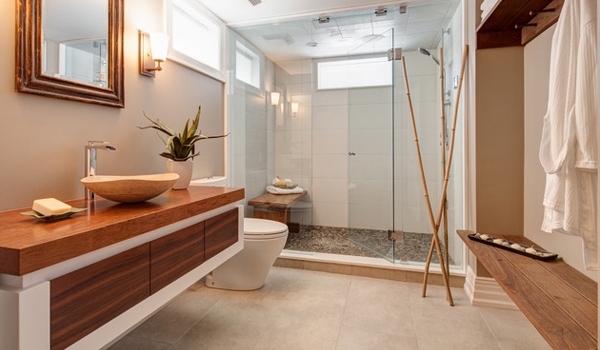 Adding wood could give a warm aura to your bathroom. You an use this in many different ways. You can use wood slats for the wall or have wooden cabinets or vanity. Some would even use wooden flooring for some areas of the bathroom. Still others make a wooden partition which gives that relaxing Asian feel. 3. Bring in some greenery. When you do this, you wll be able to bring some life in the bathroom. It could either be potted plants or even just a flower. Merely adding an orchid on the vanity can already give your bathroom a Zen look. Or try adding flowers with beautiful colors for a romantic vibe. 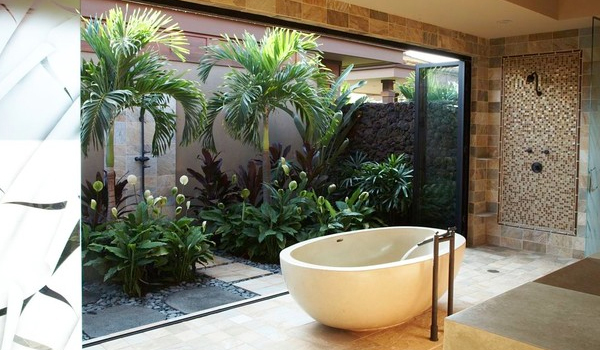 Others create an indoor garden in their bathrooms which is an even better idea! 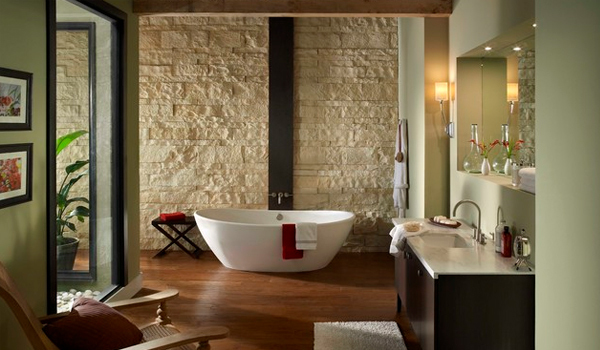 Well, it isn’t just wood that has a natural texture but you can also use stone or bricks in the bathroom. Even a pebbled tile floor will be nice and would feel good under the feet too. 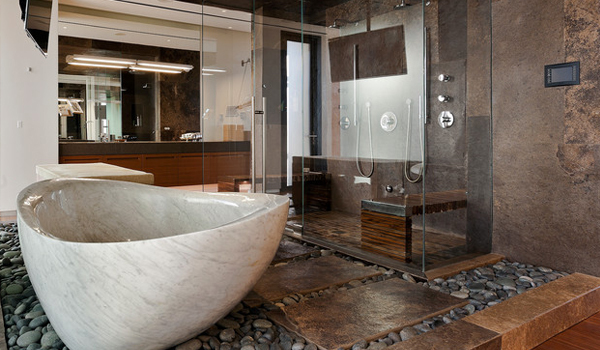 Think of using natural materials for the bathroom or add some decors with natural textures. 5. Add drama with a fireplace. When there is a fireplace, you are seemingly uniting fire and water. Doing this will give your space a warm feel and that Zen aura. 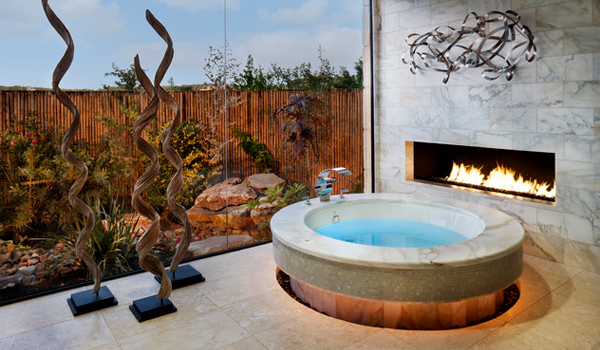 Bringing fire into the bathroom will also add another natural element to the space. Your bathroom will surely be full of drama! Well if it will cost a lot to have larger windows, then you don’t have to. Just make sure that natural light will come in and you can get a good view of the outdoor scene. This will let you relax while looking at the outdoors. Nothing beats the touch of sunlight too! 7. Scents create a relaxing mood. We all know that a spa has this relaxing aroma all throughout the space. You can do this to your own bathroom too. Get some refreshing scent for aromatherapy. You can merely hang a eucalyptus over the shower head, add some reed diffusers on the vanity or choose other organic scents. Even if you already have a fireplace, adding candles will bring more spa feel to the bathroom. But if you do not have a fireplace, candles can do the job. Scented candles are a lot better because it could also bring aroma to the entire place while adding a fire element that is relaxing and refreshing. 9. Create continuity in the bathroom. There are different ways that you can do this. You can use the same tiles for the flooring to the walls which can make your space appear bigger. You can also add clear glass because transparency can make it much larger and will hinder visual chopping of the layout. 10. Decorate with spa-like details. It is all in the details! Avoid clutter in the bathroom. Use containers that are perfect for a spa like apothecary jars. You can also roll some white towels and place them in the bathroom too. Add some Asian-inspired decor to bring a Zen feel to the space. Who said it was hard to mimic a spa for the bathroom? Well, it sure isn’t that hard! Merely adding some details to the bathroom can turn it into a relaxing spa space. You really don’t have to touch the architecture of your bathroom. Just decorate and you will get that relaxing feel that you want! Would you give you it a try?